Build an army to take on a Daedric Prince. The Hollow City — Help restore the glory of the Hollow City. I need to rebuild my army if we're going to have any chance of confronting Molag Bal and stopping the Planemeld. The mysterious Groundskeeper suggests I rescue as many people as I can and send them to the Hollow City. Complete Light from the Darkness and Breaking the Shackle. 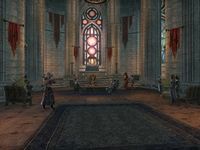 (Optional) Bring allies to the Hollow City and collect the Lights of Meridia. Talk to the Groundskeeper outside the cathedral. Talk to King Laloriaran Dynar inside the Chapel of Light before and after the Council of War. Talk to the Groundskeeper near the Cathedral in the Hollow City. She asks you to seek out the Mage and the King. While you are looking for them, you can send other NPCs to the Hollow City. She recommends starting with the Ayleid King in the west. Note that there are no quest markers for these objectives, but that The Moonless Walk and The Black Forge will be added to your map. The Groundskeeper says the Ayleid King is west, beyond the Moonless Walk, in a tower of darkness. 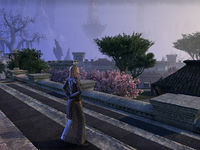 In order to unlock the tower, you need one of the Lights of Meridia, which can be obtained from the Moonless Walk quest chain. You need to complete Into the Woods at the Moonless Walk and then complete An Unusual Circumstance or The Shadow's Embrace, after which you will get inside the Lightless Oubliette. You will free the Ayleid King on the next quest from King Laloriaran Dynar, which is Light from the Darkness. After you complete the quest, talk to King Laloriaran Dynar, the last Ayleid King. He suggests using the Fighters Guild soldiers as the main force against Molag Bal. He thinks he should command of the Fighters Guild since there is no leader at the present time. You need to talk to the Fighters Guild. When you enter, they will be arguing. Wait for them to stop, then talk to Darien Gautier. King Laloriaran Dynar enters and convinces the guild members to let him lead. The Groundskeeper says Vanus the Mage is somewhere in the eastern plane, but she does not know his exact location. You need to complete Vanus Unleashed at the Black Forge, and help him complete his mission at The Great Shackle in Breaking the Shackle. After you complete the quest, talk to Vanus Galerion. He wants to consult with the members of the Mages Guild about the planar vortex. He sends you in first to introduce him. You need to talk to Nalia. She believes that Vanus Galerion died, and there are only four members of the original Mages Guild. Go back into the main room after you finish talking to Nalia. She will run out after you to greet Vanus Galerion. He says he knows how to destroy the planar vortex and end the Planemeld. However, he needs to confer with the Fighters Guild—a council of war. Talk to the groundskeeper. She says you should meet her in front of the cathedral when you are ready to launch the attack; you may wish to find more allies first. The Ayleid King and the Mage are inside the cathedral, preparing for the attack. You talk to the Ayleid King. He says a battle against Molag Bal is inevitable as you need to cross the Chasm to deal with the planar vortex and stop the Planemeld. He addresses the Mages Guild and the Fighters Guild. The king wants you to lead the assault across the chasm. In addition to the main Army of Meridia story quests, which count towards the objective Restore the Hollow City, completing the side quests in Coldharbour will generate invisible progress towards the objective Bring Allies to the Hollow City. Rescuing mages and fighters who are in battle with Daedra in the wilderness of Coldharbour also generates progress towards this objective. Once thirteen people[verification needed] have been recovered through side quests or rescued from the wilderness, the city will be considered "restored", and all of the shops and services will open. Note however that the guildhalls and certain houses will still require their related quests to be completed before they can be accessed; see The Hollow City: Restoring the City for more details. There are five Lights of Meridia hidden across Coldharbour for the objective Collect the Lights of Meridia. Only one of these is needed to rescue the Ayleid King, and this can be obtained from the quest chain Into the Woods. Collecting all of them will unlock the achievement Meridia's Lightbearer. The Groundskeeper has heard tales of where two of them could be found; one is rumored to be held in the northwest, within a tower that is not a tower, while another may be found in a vile laboratory to the southeast. Library of Dusk — Discover the fate of the lost scholars. The Moonless Walk — Rescue the Fighters Guild from the Moonless Walk. Tower of Lies — Rescue the Fighters Guild members from the Tower of Lies. The Vile Laboratory — Help Gadris and Zur reverse the soul-meld. After completing this quest, the northern gate to the Hollow City will unlock, opening the way to the Chasm and the northern Fist of Stone region beyond. The only way to reach Fist of Stone other than completing this quest is to enlist the aid of another player who has already made the trip. You can group with them and have them travel to any wayshrine north of the city, then teleport to them from the Group menu. You may also do the same with anyone in your friends list or in any guild you are in. King Laloriaran Dynar is imprisoned to the west, beyond the Moonless Walk. Vanus Galerion is trapped somewhere to the east. I should also watch for any of the other missing Fighters Guild and Mages Guild members, or anyone else who can help me. The Lights of Meridia contain a portion of Meridia's power. I need them to set King Dynar free, and they may have other uses, as well. The Hollow City is the perfect staging point for our assault. As I rescue the missing Fighters Guild and Mages Guild members, I should send them here. I rescued enough people to reassemble our army. I should find the Groundskeeper near the Hollow City chapel and discuss our next steps. King Dynar and Vanus have convened a council of war within the Chapel of Light. They're waiting for me to join them. I should head inside and figure out our plan of attack. The council of war has begun. I should hear what everyone has to say. Finishes quest We destroyed the Great Shackle, but the Planemeld continues. The council of war has decided to assault the Chasm and fight our way to the remaining planar vortex. Only then can we seal the connection and save Nirn from the Planemeld. This page was last modified on 19 December 2018, at 11:29.